Week 5-Mix and Match-we choose one colour and you add the other colour to ours to create your own "Dynamic Duo". 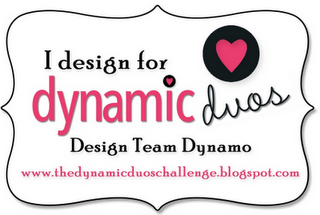 Be sure and stop by Dynamic Duos on May 5th to enter the inaugural challenge! All products are welcome and you may combine with other challenges as well! BIG CONGRATS Allisa! I'm so excited to be part of this team with you, can't wait to get started! So excited to be working with you Allisa!! Hooray! Hi Allisa! Congrats and I'm looking forward to seeing your creations and playing along! Congrats, Allisa! Looking forward to seeing your work and taking part! I'm excited to get this gig going and am looking forward to creating with you! I am so happy to creating with you for Dynamic Duos!